Calcitonin gene-related peptide (CGRP) is a signaling neuropeptide released from activated trigeminal sensory afferents in headache and facial pain disorders. There are a handful of CGRP-targeted therapies currently in phase 3 studies for migraine acute treatment or prevention. Currently, 4 monoclonal antibodies targeting either the CGRP ligand or receptor are being studied for migraine prevention: ALD403 (eptinezumab), AMG 334 (erenumab), LY2951742 (galcanezumab), and TEV-48125 (fremanezumab). Patients with CH often require a multimodal treatment approach during cluster periods using acute, transitional, and prophylactic therapy. 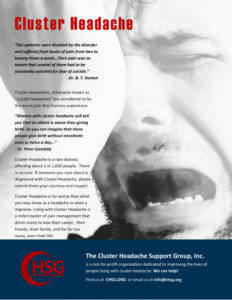 Transitional therapies are useful in treating high frequency cluster headache attacks while prophylactic medication dosages are increased. However, there is limited data comparing the efficacy of oral versus injected transitional treatments.